In 1964 Palatine was a much smaller town. After Mr. Roger Ahlgrim moved into his new building he made a decision as to what to do with the extra room the basement provided. Following his love of miniature golf he began construction of one of his own. This kept himself and his only staff member busy while the funeral business grew. 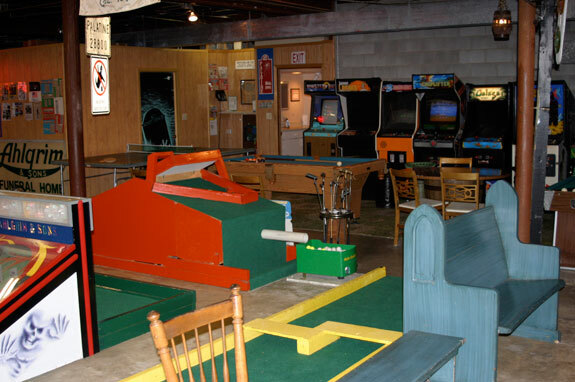 Over the years the miniature golf course took on a life of its own. 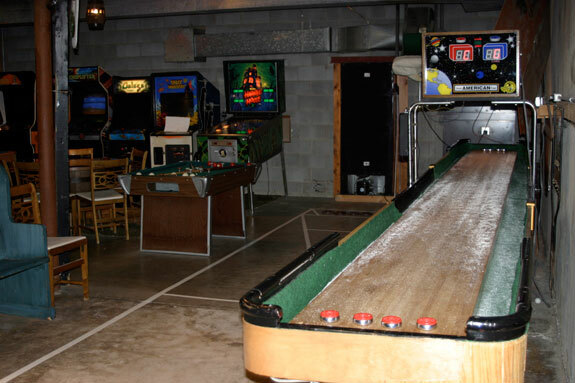 By the time his children became school age, the basement housed a 9 hole miniature golf course, a full size shuffle board coarse, ping pong table, bumper pool table and a foosball table made by Roger during his high school years. As Mr. Ahlgrim became active in church and civic groups and his children became active in Scouts and Indian Guides, meetings were held in the room. Currently some video games have been added and the décor is accented with the many articles and letters written about the community room. With a haunted theme, each hole has its own character. Hole 2 putts through an old shipping box used for rail transportation. Every course has a windmill, but this one also has a guillotine, mausoleum and hole 9 has a water trap. If being located under a funeral home isn’t special enough, Halloween makes the Community Room even more alluring. The Community Room is strictly never used during funeral business. We have been filmed and on radio nationwide, even in a couple of other countries. We have met some wonderful people that have come to visit the community room. Families have planned a visit to us into their vacation and vacations have been planned around a visit to this unique Community Room. This room has as many memories as those made with the people we serve.